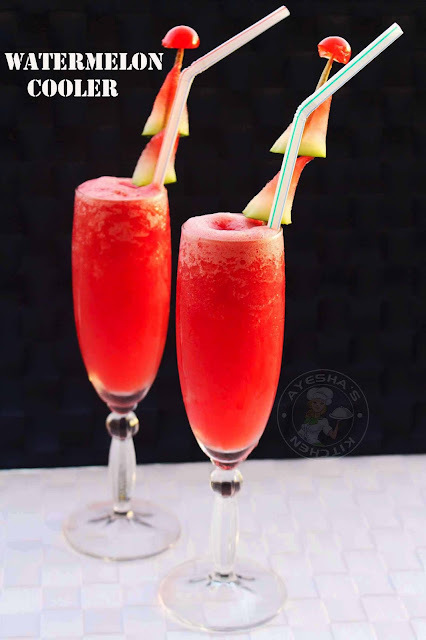 In this hot summer, watermelon is considered as one of the best thirst quenchers. Especially when Ramadan falls in summer, watermelon fruit helps us to remove dehydration which makes this fruit ideal for making juice in hot summer. As the moisture content in watermelon fruit is very high, consumption of this fruit helps us to stay hydrated which plays a vital role in our health. Moreover, watermelon is a good source of vitamin A, vitamin C, and many other nutrients. So this wide range of beneficial nutrients hooked me to watermelon recipes especially watermelon juices, watermelon ice pops, watermelon puddings, watermelon smoothies, watermelon cocktail recipe and even watermelon ice cubes. 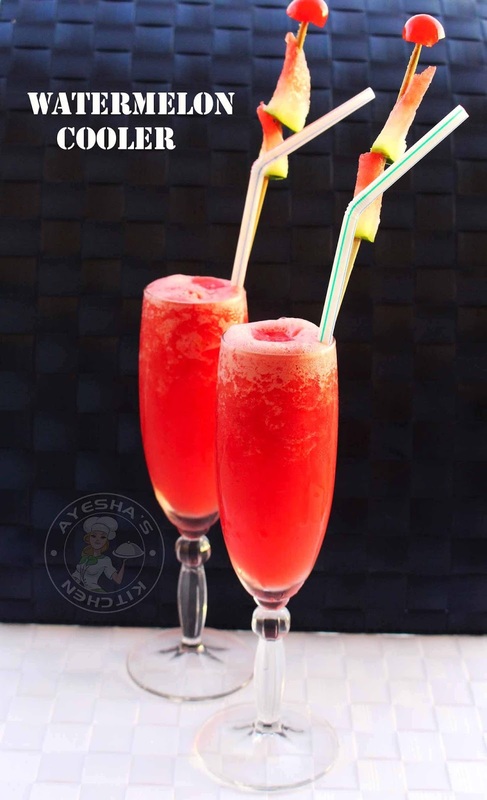 This recipe for watermelon cooler makes our body chill for sure in this hot summer. Yes, one of the best drink to beat the heat. Freeze some watermelon juice in ice cube molds and then make fresh watermelon juice with some orange juice. Pour until half of the serving glasses and fill the remaining space with prepared watermelon ice cubes. Do try and let me know how it turns out for you. Here is the recipe showing how to make watermelon cooler / fresh watermelon juice /watermelon juice recipe /making watermelon juice. Add one cup of watermelon pulp or cube into the blender along with sugar. Blend it well and pour this juice to an ice cube mold. Let it freeze. When the watermelon ice cubes are done, blend the remaining watermelon cubes in a blender (no need of adding sugar) until smooth. Pour this prepared juice in serving glasses until half of the glasses. Fill the remaining portion with watermelon ice cubes.